Introducing The Dixie Queen, our newest, on the gulf, beachfront stunner with private wood plank walkway leading straight to the white sandy beach. 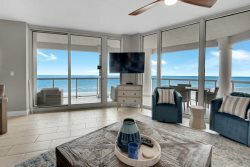 Oversized windows, and wood decks showoff 360 degrees of Gulf and Sound views capturing the breathtaking emerald coast and Pensacola Beach surrounding. Never on the rental market this home has been professionally upgraded and designed to entertain. Boasting over 5000 sq. ft of style, fresh & new furnishings, bedding and décor in every room. Smart features, flat-screen TVs and Sonos sound system throughout. With an elevator to breeze you to each level, be amazed as every bedroom has ocean front views, sliding glass doors with wood decks and private bathrooms. The beach level bonus game room is huge, air-conditioned with bunk beds, TVs and 2018 brand new games. The third floor includes a living room loft space with even more ocean views and cozy bunk nooks for additional sleeping areas when needed. During winter 2018, The Dixie will undergo phase II renovations plus also adding a pool! Need we say more, additional details below or call us with questions. Book the Dixie Queen today, an incredible house for your next fantastic vacation. Rate info: The pricing for 2018 Summer and Fall reflects the current phase first renovation and description above. Pricing for 2019 will reflect the second major renovation with pool and other major additions. For 2018 the home has 4 traditional bedrooms, each with their own bathroom. Every bedroom leads out to a Gulf front deck with amazing beach views. Three of the bedrooms are on the top level including one that has a handicap set up bathroom with easy access from the elevator. The 3 upstairs bedrooms have king bed, king bed, and two queen beds. The downstairs bedroom has two queen beds. The other sleeping spaces are “The Top Loft” and “The Beach Bunk & Game” room. These spaces are simply cool. The beach level Bunk & Game Room is huge and air conditioned. It hosts two sets of triple queen bunk beds, 3 Flat screen TV’s and these great games: ping pong table, shuffleboard table, foosball, and ring toss game. The Loft room on the top floor offers more living space and another Flat screen TV. The loft has a comfortable queen sleeper sofa and a cozy wall nook with two twin bunks. Additionally, every bedroom has 2018 new flat screen smart TV and the home is also equipped throughout with wireless Sonos sound system. In 2019 The Dixie will undergo the second phase renovation to add another traditional bedroom, new flooring, and a private pool! We expect this will absolutely be the most requested home on Pensacola Beach! Please inquire with any questions. Your team was extremely responsive. Having a dedicated concierge member to answer questions was very helpful and easy. We had a wonderful stay in late March at this home. It was picture perfect in every way, and greatly exceeding our expectations. I never wanted to leave!! Mr Cook assured me we would love this house & he was so RIGHT!! Exceptional place!!! We did have some cable issues but Natalie went out of her way to get or issues resolved quickly!! Very friendly staff. Even got to watch the Blue Angels return home on Sunday. Gave me chills to see them fly by! We had a fabulous time THANK YOU SO VERY MUCH!!!! We would love to stay here again!! Extremely helpful. Quick response to our phone calls. Very accommodating.